Generally I love my Amiga 1200 especially the ability to load games quickly from the hard drive. However every now and then I get frustrated when one of my favourite games either doesn't work even when using fix it tools such as degrade. Cave Runner is a case in point. Back in the 1990s I loved playing this game on my Amiga 500 and recently I tried to add it to the cd32 compilation disk. During testing I was excited to see the title screen to load followed by the game screen. Then everything went wrong. Either the character disappears when you move him or he moves at such speed that the game is unplayable. During this month trawl of public domain games beginning with C, I came across this version which is apparently fixed for Amiga 1200. I have played the game on an emulator and everything seems to work fine. My challenge now is to add it the CD32 compilation disk and see if everything still works as it should. 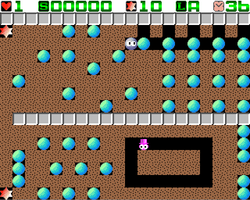 For those of who have never played this game, you have probably guessed from the screen shot that it is a boulderdash clone. The character is cute, with cartoon eyes that roll around in a very endearing manner. The levels are layout in a manner which makes you think about your route rather than speed along blindly. I know there are other boulderdash clones available, including the endless Emerald Mine series but this one has a charm which oozes from the sreen. If you have never played this game then download the game and give it a go, I am sure you will have an enjoyable time. This game perhaps should have won game of the month. It was a very close call. In the end the reason why it didn't is that I ve played Cybernetrix endlessly in the past and therefore it has lost its freshness to me. 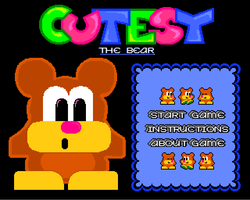 If you haven't played either Cutesy Bear or Cybernetrix then definately download this game and play it - you will not be disappointed. The game is a hybrid of Asteroids and Defender. 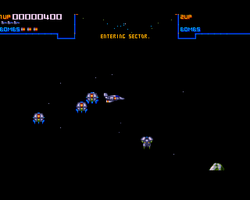 It is a horizontal shoot em up like defender and you have the same radar screen as used in Defender. You also have asteroids which fly at you and similar to Asteroids these become smaller asteroids when you blast them. When you blast the smaller asteroids you can be rewarded with a crystal which gives you a large points bonus. What is the aim of the game. Like all good arcade games it is kept simple. Destroy everything on the screen and then you progress onto the next level. This game isn't going to make you think too much but it is a good old fashioned, fast paced shoot em up. If you take too long to complete a level, then an assasin will appear and these ships are extremely difficult to kill as they take more hits to kill than the other ships. Overall the game is high quality through out. The sound effects, the menu music, the sprites, graphics and exploisions are all top draw. It was originally released as shareware but could easily have been a budget commercial release. This game is currently included on the CD32 Game compilation and the work in progress Amiga 1200 Hard Drive Compilation version. This game was a complete new find and one I was unaware of at the time I had my Amiga 500 back in the 90s. This probably worked in its favour in awarding the game the title of game of the month as it had a freshness to it which other games reviewed this month lacked due to them being firm favourites of mine for a long period of time now. The games itself doesn't break any ground in new game design but what it does, it does well and the overall presentation is very professional. The aim of the game is to clear the level of the creepie crawlies. You do this by pressing fire and pushing up wards to knock the platforms the creepie crawlies are walking along. They then fall over, similar to Doody and you move your bear character over them to remove them from the game. The sound effects are cartoonish and compliment the graphics effectively. The game design is simple but the overall presentation is similar to the cute platform games of Rainbow Islands and Rodland which were two of my favourite amiga platform games. 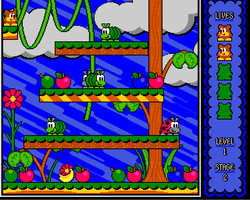 This game can't hope to compete with those titians but as the author states, the aim of the game was to show that it is capable to make a fast, smooth game using only Amos Pro basic. From that point of the view the game meets its aim and would have inspired me to have had a go at trying to program in Amos if I had played it at the time of release. I wanted to include this game on the CD32 compilation disk but unfortunately I have not been able to transfer the Adf to the cd. Video of Cutesy Bear taken from Youtube - uploaded by S2325.